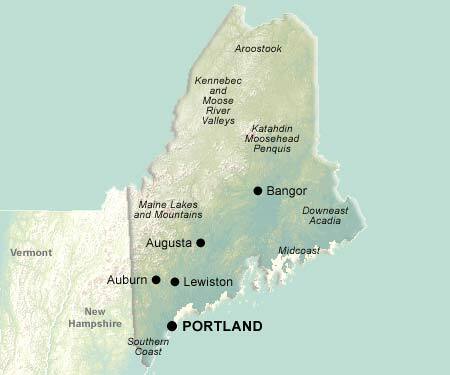 Eighty percent of Maine, the easternmost of all US states, is covered by forest -- development is concentrated along the coast, especially the south coast. It is the largest of the six New England states, but has fewer people per square mile than any of the others. Most of the upstate area is wilderness, offering unmatched outdoor opportunities in all seasons. Along its slanted coastline, Maine features sandy beaches (primarily in the south), rugged, rock-strewn shores with high cliffs, panoramic views and giant stone outcrops. Portland, Maine's largest city, is located on the Casco Bay, the closest major US seaport to Europe. Bar Harbor, in the midst of Acadia National Park, is one of the state's most popular getaway towns. In prior centuries, shipbuilding was Maine's dominant industry, but lumber, fishing, and tourism are now the dominant forces in the economy -- Bath Iron Works is still the largest employer in the state, but Maine's association with maritime construction is increasingly sentimental with each passing year. Due to poor soil, Maine does not have much agricultural output to speak of, though its blueberry crop is a notable exception -- 99% of the national blueberry harvest comes from Maine. Another food industry dominated by Maine is lobster production -- 90% of the US lobster catch is brought in from the abundant beds off of the Maine seacoast. A meal of ultra-fresh lobster bought from a local supplier is one of the quintessential Maine tourist experiences.